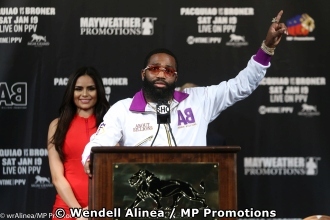 LAS VEGAS: Never mind that challenger Adrien Broner turned what started as a normal press conference on Wednesday of his coming fight with World Boxing Association welterweight champion Manny Pacquiao to an exchange of expletives with Hall of fame broadcaster Al Bernstein. The 29-year-old title pretender, nonetheless, sent a message of confidence to handle the Filipino belt-owner when they face off on Saturday (Sunday Manila time) at the MGM Grand Arena here. Always cocky in his predictions, the former four-division world champion believes he can win the biggest bout of his career and succeed where he failed prior this fight. "Every fighter is different, but I know if I touch him flush, I'll put him out. It's no secret, he's been to sleep before," Broner said in reference to Pacquiao’s having been stopped three times in his 69-fight, 24-year pro-career. Broner (33-3-1, 24 KOs), forgot to mention though his defeat to the best opponents he has faced in Mikey Garcia, Shawn Porter and Marcos Maidana. He has never been stopped though. Broner said being an underdog is no big deal. "We're ready for whatever this fight is going to end up being," he said. "It could definitely be a war. I've always been an underdog. I came from the trenches and I'm bringing that mentality into the ring. I can take over boxing with a win over Pacquiao. "I don’t care about eight-division champion. I’ve always wanted to fight the big names like this and I knew that I just had to keep working hard and the time would come,” he said. Trainer Kevin Cunningham, who is working as Broner's corner man for only the second fight but has known him for many years, vouched for Broner’s chance to erase the disappointing losses with the upset over Pacquiao. Near the conclusion of the presser held at MGM’s David Copperfield Theater, Bernstein took the stage to preside over the question and answer portion of the proceedings. After asking Pacquiao several questions, he turned to Broner and asking an innocuous query about what victory would mean to him, things went off the rails as Broner turned ballistics. Bernstein was caught off-guard by the outburst forcing organizers to end the event.